Charles Dickens’ great-great-grandson has spoken out against plans for an estuary airport, which would ruin the marshlands and countryside made famous his ancestor. This area provided the setting for Great Expectations – one of Dickens’ greatest novels. He is horrified by the plans to build on the marshland, bordering the area of Kent where Dickens lived and died. This year is the bicentenary of Dickens’ birth, with a festival all weekend in celebration in north Kent of his life and work. In the opening scene of Great Expectations, Dickens describes the marshes as a “dark, flat, wilderness… intersected with dykes and mounds and gates, with scattered cattle feeding on it”. Dickens loved this part of Kent, he lived and died in Higham, he took his honeymoon in Chalk and he often walked across the Marshes for inspiration. Charles Dickens’ great-great-grandson has slammed government plans for a Thames Estuary airport in the countryside made famous his ancestor. Gerald Dickens, 64, claimed ‘Boris Island’ would ruin the estuary marshland, which famously provided the setting for Great Expectations – one of Dickens’ greatest novels. With this year marking the bicentenary of Dickens’ birth his descendant revealed he had read “with horror” plans to build on the marshland, bordering the area of Kent where the novelist lived and died. The proposed airport, which has been designed by renowned architect Lord Foster, will carry 150 million passengers a year – twice as many as Heathrow – sparking angry protests from local families and environmentalists. Gerald has defended the wild space as crucial to Britain’s economic, environmental and cultural “heritage”. He said: “I read with horror renewed plans to situate yet another London airport on the north Kent marshes. “Great Expectations has to be one of the greatest, one of the most atmospheric opening passage of any book and Charles Dickens knew the countryside so well that he captured it forever. “What a terrible thing it would be if our only idea of the Marsh country was taken from his words. “As it is, we can stand alone in the Churchyard, we can look at the gravestones, we can gaze across the river towards the sea and we can stand in the footsteps of one of our country’s finest sons. “My great-great-grandfather loved this part of Kent, he lived and died in Higham, he took his honeymoon in Chalk and he often walked across the Marshes for inspiration. He added: “The Hoo Peninsula is not only a setting for one novel, it is the inspiration for many scenes, many characters and a catalyst for some of the most important reforms in the history of Great Britain. The government is due to start a consultation on airport aviation capacity for the south east of England before the parliamentary summer recess in July. If approved, the plan, which has been heavily backed by Boris Johnson, will construct a four runway airport at the Isle of Grain in north Kent. The plans come amid fears that the capital will lose out to competition from Paris, Amsterdam and Frankfurt if it fails to increase its capacity for air travellors in the south east. 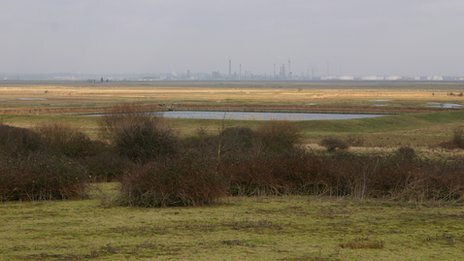 The Isle of Grain forms part of a small outcrop of land in north Kent called the Hoo Peninsula, where the north kent marshes are also based. The area is a unique wetland habitat, which provides a home to 300,000 migrating wildfowl and other birds annually. Local campaigners say an airport on the scale proposed would see the whole of north Kent being concreted at a cost of up to #70 billion. Airline industry experts, including the outspoken Willie Walsh agree the airport would be on the wrong side of london and come at too high a cost too much to make it worthwhile. Wonderful article and kudos to Gerald Dickens for his views. Once we have lost our history, what will we have to give our descendants? A big, ugly bit of concrete destroying air quality and polluting us with noise? The airport can be enlarged, restructured, or rebuilt elsewhere in our country which has already been ruined by the debauchery and greed of big business. Jobs can be gotten in areas that are hard hit by this economy. Leave us in Kent with the beauty of the estuary, the lives of our wildlife, and enjoyment of being a part of the history of this wonderful country. Charles Dickens lived in Medway for almost 20 years, absorbing the area’s architecture, character and colour and bringing it to fictional life in some of his best-known works. For over three decades we have celebrated our proud association with Dickens and this year, 200 years after he was born, we are delighted to present a family festival packed with Dickensian delight and Victorian intrigue. Whether this is your first Rochester Dickens Festival or you’re a regular, get ready for a feast for the senses. From costumed parades and street acts to competitions, readings and a fair, Rochester’s streets and green spaces will be awash with entertainment. We’ve transformed the tranquil Vines into a craft fair and performance area and to celebrate this special year we’ve introduced themes for each day. Friday – a day for children, including a special circus show in the evening. Saturday – welcome to the Grand Pageant Day, themed around Dickens’ famous novels and iconic characters. Sunday – a commemorative day, featuring the Grand Parade. Would Dickens recognise Great Expectations landscape? If Dickens returned to Thames Marshes would he see the same landscape which inspired Great Expectations? On a ridge between the village of Cooling and High Halstow on the Hoo Peninsula sits the RSPB’s Northward Hill Reserve. It overlooks Thames Marshes – a harsh, dramatic landscape – the landscape which inspired Charles Dickens to write Great Expectations. As a young boy Dickens used to take long walks with his father in the area and this continued when he returned as a successful author to live nearby in Higham. In the opening scene of the book, Dickens describes the marshes as a “dark, flat, wilderness… intersected with dykes and mounds and gates, with scattered cattle feeding on it”. Rolf Williams, from the RSPB in Kent, believes that Dickens’ description of the marshes back then is still true for today. “It would have looked very much the same 200 years ago,” he said. The land between Northward Reserve and the sea wall is crossed by ditches which Dickens describes in the early chapters of Great Expectations, as a young Pip crosses them to get to Magwitch to give him food. Mr Williams said the ditches had been dug to drain the land of excessive water so sheep and cows could walk across without getting bogged down and possibly diseased. In the novel, Dickens describes the River Thames as a thin line on the horizon. Instead of the great bulk of a container ship, Dickens would have seen a mass of masts and dark red sails moving slowly up and down the river. Mr Williams said the biggest threat to the landscape that inspired Dickens came from a proposed £50bn airport in the Thames Estuary. “What you are seeing in front of you would be utterly destroyed, it would be wiped off the map and [concreted] over,” he said. “Part of the tragedy is that you don’t only lose the natural habitat, you don’t only lose the agricultural land, but you lose this wonderful part of our cultural history. Charles Dickens was born in Portsmouth in 1812. In 1817 his father, who worked as a clerk for the Royal Navy, moved the whole family to Chatham where he took up a post in the Royal Dockyard. The Dickens household was based first in Ordnance Terrace and later at St Mary’s Place, on The Brook. Although young Charles moved to London along with the rest of the family in 1822, he had by that time developed a strong feeling of affection for the Medway area. In 1856, as an enormously successful and well-known author, he bought Gad’s Hill Place in Higham, just outside Rochester. Until his death in 1870, he became a familiar figure walking energetically around the Medway Towns, to and from Gravesend Station, or out on the Hoo Peninsula. On either side, the banks of the Medway, covered with cornfields and pastures, with here and there a windmill, or a distant church, stretched away as far as the eye could see, presenting a rich and varied landscape, rendered more beautiful by the changing shadows which passed swiftly across it, as the thin and half-formed clouds skimmed away in the light of the morning sun. Dickens’ associations with Medway still bring many thousands of tourists to the area, who come to enjoy the festivals and see the sights that inspired him. Posted: Saturday, June 9th, 2012. Filed in News about Airports, Recent News.